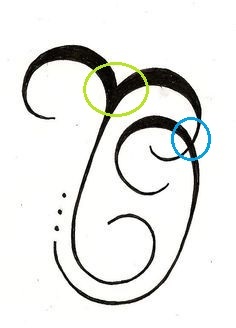 How can I join the wire in between the places where the lines are overlapping (the blue encircled part), as well as where the two horns of the Aries symbol are emerging from the branch (the green encircled part)? Could you suggest a successful method other than soldering? Any other advice would be appreciated too, as I'm new to this. Thanks! I'm sorry, but I have my doubts you could ever create this design with metal wires. The overlap in the blue circle is very thin (fragile), but has to withstand high leverage forces because of the long structure attached to it. You need to join both symbols in the bottom margin of the design as well to make it more stable. You need to roughen the surface of the metal to give the adhesive something to grab onto. This can be done with a nail file or a knife, but it might bend the wires too much. Epoxy is a strong adhesive, but it's inflexible and no more solid than plastic, so it breaks easily if it's too thin. A flexible power adhesive doesn't break, but in general it needs a bigger surface area to be able to hold objects together. Many power adhesives have to be "activated" by applying a force, which would bend your pendant. The adhesive will show. There's not a chance you can apply so little adhesive that it won't be squeezed out but still hold both pieces together. In fact, the safest solution would probably be to completely coat the juncture in resin. Instead of trying to glue wires together, I think you could try sawing the pattern out of a solid metal plate. Then everything is connected from the beginning and you don't have to solder / glue pieces together. Or you could encase the whole design in resin (like a mosquito in amber). A google search for "resin jewelry" yields many different approaches (with and without molds) and products (resins and accessories). Other than using wire, you could create the design using precious metal clay such as silver metal clay and setting it in a kiln or you can use a blow torch and fire-proof mat. Fine silver metal clay results in objects containing 99.9% pure silver, which is suitable for enameling.